Wow, I guess it's been two weeks. Doesn't seem that long. Plenty to talk about then. Three days from now, I'll teach my first-ever last class. It's the last week of term, and it's short because exams begin on Thursday, so my rowdier, younger class will only meet the first three days of this week. So on Tuesday I'll bring in juice and cookies (which I do intend to bake myself; already bought the ingredients), and we'll have 45 final minutes to talk about the big questions. I'm not sure how I feel about it yet. The counter-downer in me is excited: we're less than a month from winter break now, and since I'm not giving a final exam, next week (Term 1 finals week) is more or less a massive vacation with only two weeks of teaching on the other side. Something tells me the next four weeks are going to move incredibly quickly. Another part of me is sad, and naturally so, I think: I have enjoyed working with these two classes, and I'll definitely miss their enthusiasm and their intellect and everything they've brought to the class and taught me so far. But yet another part of me is glad that I'm so close to escaping this first term of teaching, when I made so many mistakes, because starting fresh means getting to try to erase them (and inevitably make new ones, but we'll cross that bridge when we come to it). So it's a mix of all kinds of feelings that's taking me into our final few days together, and I'm still in the midst of putting together the week's lessons: the last couple will be pretty straightforward, but how do you conclude a philosophy class before the inevitable Big Final Discussion? Right now I'm thinking we'll do two days on The Meaning of Life, which is all well and good to say, but it means you have to figure out what you're actually going to do which hasn't been as straightforward. Comment if you have an old lesson plan lying around. No pictures here, because we weren't allowed to bring our cameras, but here's what happened: we had a day off from school on November 5 for "Islamic New Year" (which nobody seems to care about) and I foolishly volunteered to lead interested students on a hike. I kinda thought other people would volunteer, and I kinda hoped no kids would sign up, but of course, there I was at 8:30 with one other teacher, schlepping our way into the desert for what I imagined would be an enjoyable, if not thrilling, few hours in the desert. First off, it ended up being TEN hours (which I had only sort of been aware of beforehand). Second off, it ended up being INCREDIBLE. Turns out that in addition to the desert hiking and wadi wading I was expecting, this hike included rappelling down waterfalls. We all wore wetsuits and harnesses, which looked awesome, and twice over the course of the hike we'd clip ourselves into a hook that had been drilled into the rock face, and uneasily edge out over the lip of a cliff below. The first one was about 35 meters down a nice sandy cliff; you couldn't really see what you were climbing down until you reached the bottom and realized you'd been alongside a very beautiful waterfall the whole time. A couple kids did take pictures, now that I think about it - I'm going to email Omar right now to see if I can get those. OK, email sent. The second rappell (?) was where the real action happened. We knew it would be longer, 50 meters this time, and we knew something interesting happened after the first few steps. Turns out that the first few steps were the only few steps, because this one was fifty meters down through space directly in the waterfall. Picture a waterfall cascading through air, and now picture a person gingerly lowering himself down through the path of the waterfall, and now picture me being that person. It was absolutely incredible and further proof that no matter what, going is preferable to not going. Yes, it was ten hours, but would the next day's class really have been that much better if I'd had ten more hours to plan it? I will definitely never forget Zarqa Ma'in, partly for those waterfalls but mostly for reminding me that it's always worth it to put yourself out there. 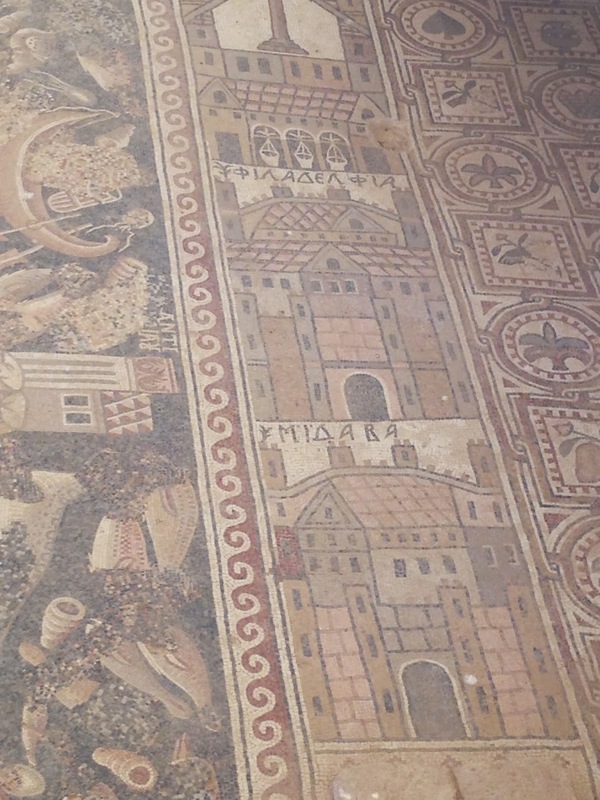 Yes, it says "Madaba" in Greek. 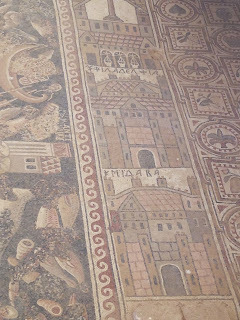 Yes, this mosaic is 1500 years old. It's still called Madaba, even though now it has a pizza place and a Popeye's knockoff. History is really cool when you're in it. Apparently I live in what was once Moab, as in Moab from the Bible, which I had not realized until this trip. That was a week ago? Things happen fast sometimes. - a few preparations of face: fatteh (yogurt and bread) with cheek meat; broth made with the head; and the literal face of the animal sitting on a plate. Cheek meat is delicious. Many of my companions were preeetty grossed out, but I honestly loved it all. It probably helped that I was extremely hungry, but I would happily go back there and eat the same things again, especially the liver, the tongue, and the two dishes below. Of course, after being so adventurous with food, I had no qualms about taking a Yale friend out to Hashem (the classic downtown falafel and hummus joint) the following night. This turned out to be a mistake, because Hashem left me with a fairly serious case of food poisoning that lasted the better part of the week. I didn't think that this early in my teaching experience I'd have the thrilling experience of excusing myself from teaching (Glee Club rehearsal, in this case) to quickly let my lunch back up the way it came, and then returning to get right back into the rhythms of "Do You Hear the People Sing." Ordinarily I wouldn't be that gross on this blog, but if you made it through the karshaat, hopefully you'll be just fine here. But don't worry, parents and grandparents: I saw the school doctor, drank lots of tea, and avoided the bad kinds of food, and now I'm feeling just fine, as evidenced by the fact that I gorged myself on cupcakes at the new art teacher's birthday party last night. All will be well for this final week of teaching. Those are some pictures and some thoughts; I think I'll have more time to keep up in the coming weeks because of exams. Hopefully the free time will bring more trips and adventures; I intend to keep seeking them out and taking every opportunity that comes my way. Of course, the real challenge is making sure to put yourself in the path of oncoming opportunities in the first place, which requires creativity, initiative, and enthusiasm that I'm always trying to work on. Plenty more learning to do in the month before December 13. We'll talk again before then; for now, I'm going to put my laundry in the dryer and take a nap. Napping is important too.